Donald Trump arrived in Israel today to help the Israeli-Palestinian peace process progress. Tel Aviv: After an exhausting two days in Saudi Arabia, US President Donald Trump arrived in Israel on Monday, attempting to revive the stalled Israeli-Palestinian peace process with visits to Jerusalem and the West Bank. Over two days, Trump is to meet separately with both Israeli Prime Minister Benjamin Netanyahu and Palestinian President Mahmoud Abbas and visit holy sites. On Monday in Jerusalem, he will pray at the Western Wall and visit the Church of the Holy Sepulchre. 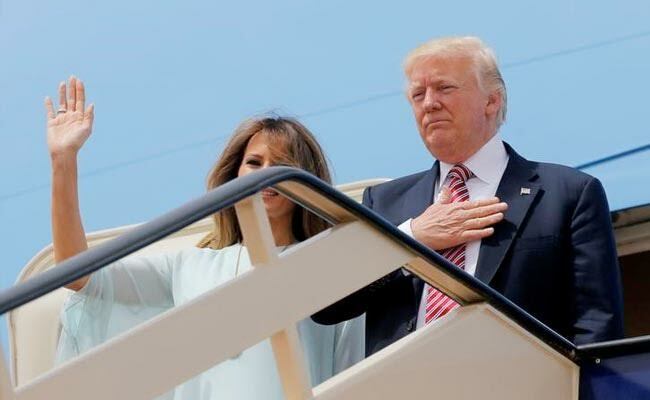 Netanyahu and his wife Sara, as well as Israeli President Reuven Rivlin and members of the Israeli cabinet, were at Tel Aviv's Ben-Gurion airport to greet Trump and First Lady Melania in a red carpet ceremony after a direct flight from Riyadh. On his maiden foreign tour since taking office in January, Trump is already showing signs of fatigue from a packed schedule. He is on a nine-day trip through the Middle East and Europe that ends on Saturday after visits to the Vatican, Brussels and Sicily. During a speech in Riyadh on Sunday in which he urged Arab and Islamic leaders to do their share to defeat Islamist militants, Trump referred to "Islamic extremism," although advance excerpts had him saying "Islamist extremism." A White House official blamed Trump's fatigue for the switch. "Just an exhausted guy," she told reporters. On Sunday night in Riyadh after a long day of events, many of them delayed, he skipped a "tweeps" forum for young people that was to be his last activity of the day, sending daughter Ivanka in his place. Over the weekend, Trump received a warm welcome from Arab leaders, who focused on his desire to crack down on Iran's influence in the region, a commitment they found wanting in the Republican president's Democratic predecessor, Barack Obama. The reception marked a contrast from his difficulties at home where he is struggling to contain a mushrooming scandal after his firing of former FBI Director James Comey nearly two weeks ago. Trump has vowed to do whatever is necessary to broker peace between Israel and the Palestinians, but has given little sign of how he could revive long-stalled negotiations. When he met Abbas earlier this month in Washington, he stopped shortly of explicitly recommitting his administration to a two-state solution to the decades-old conflict, a long-standing foundation of US policy. Some Palestinians said they were disappointed by the omission. A senior administration official told Reuters last week that Trump remained committed to his campaign pledge to ultimately relocate the embassy but did not plan to announce such a move while on his trip. "We're having very good discussions with all parties and as long as we see that happening, then we don't intend to do anything that we think could upset those discussions," the official said. On Sunday, Israel authorised some economic concessions to the Palestinians that a Cabinet statement said "will ease daily civilian life in the Palestinian Authority after (Trump) who arrives tomorrow, asked to see some confidence building steps." In his speech attended by dozens of Arab and Islamic leaders, he toned down the harsh anti-Muslim rhetoric he had employed during the presidential campaign last year in favor of trying to gain cooperation against Islamist militants. Trump will have visited significant homes of three major religions by his trip's end, Islam, Judaism and Christianity, a point that his senior aides say is important in bolstering his argument that the Islamist militancy is a battle between "good and evil."